Bleeding or spotting during pregnancy can be a scary experience for expecting moms, but it isn’t always cause for concern. Spotting during pregnancy is common, especially during the first trimester. If you notice a few drops of blood in your underwear, this is considered spotting. Spotting can range in color from light pink to red to brown. Heavier bleeding—enough blood that you need a liner or pad—can be a sign of a more serious condition and should immediately be checked out by a medical professional. This type of bleeding can range in color from red to brown. If you are bleeding or spotting and pregnant, don’t panic. Many women who experience spotting go on to have a healthy and normal pregnancy, and about 50% of women with heavier bleeding go on to have a healthy pregnancy and baby. However, vaginal bleeding at any point during your pregnancy can be a sign of a problem, so it is important that you see a medical professional to rule out any serious causes. If you are concerned about vaginal spotting or bleeding during your pregnancy, the first step is to call your obstetrician and tell them about your symptoms. If you are unable to reach your obstetrician, or need immediate medical attention, you can stop by your local FastMed Urgent Care for prompt treatment. 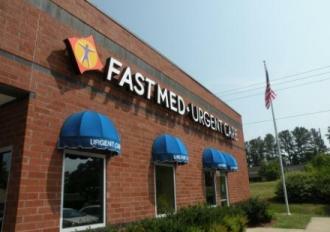 FastMed is open 365 days a year with extended hours, and our caring staff is trained in adult and pediatric urgent care.